Summary: June 9 morning, Jining City e-commerce work site meeting was held in Sishui County, Jining Vice Mayor Zhang Shengming, Municipal Government Office Deputy Director Liu Jiaqi, Municipal Bureau of Commerce Secretary Yan Baichuan and the government principals of all counties, cities and districts, Jining high-tech Zone, Taibaihu New Zone, Jining Economic and Technological Development Zone Administrative Committee principals, head of the Ministry of Commerce, Municipal E-commerce leading group unit members and more than 100 people of the city's key e-commerce enterprise representatives attended the meeting. 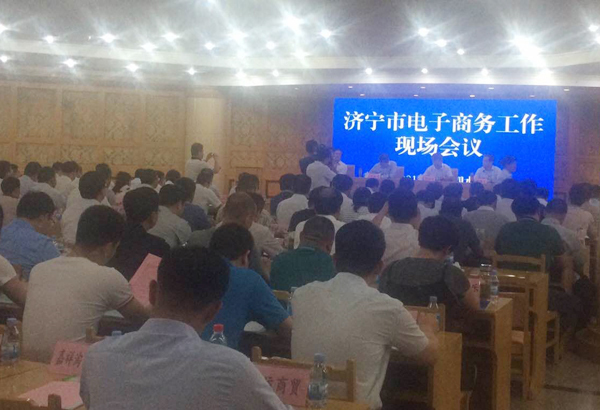 June 9 morning, Jining City e-commerce work site meeting was held in Sishui County, Jining Vice Mayor Zhang Shengming, Municipal Government Office Deputy Director Liu Jiaqi, Municipal Bureau of Commerce Secretary Yan Baichuan and the government principals of all counties, cities and districts, Jining high-tech Zone, Taibaihu New Zone, Jining Economic and Technological Development Zone Administrative Committee principals, head of the Ministry of Commerce, Municipal E-commerce leading group unit members and more than 100 people of the city's key e-commerce enterprise representatives attended the meeting. Before the meeting, the participating leaders and enterprises first visited numbers of e-commerce enterprises of Sishui County for the overall understanding of the e-commerce development. 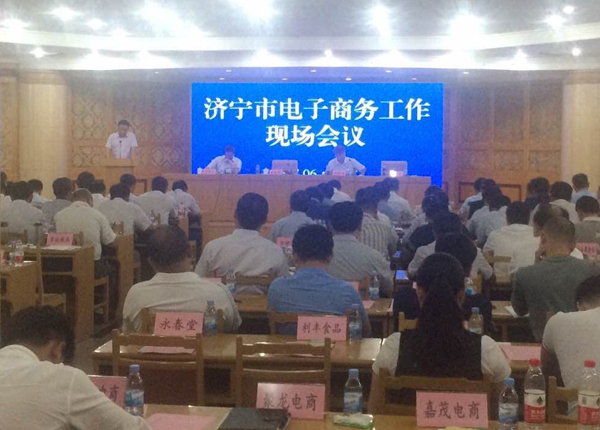 Subsequently, in the city's e-commerce work conference, Jining City Bureau of Commerce Yan Baichuan informed the development of the city's e-commerce, Jining City Vice Mayor Zhang Shengming made an important speech. Major Zhang pointed out that Jining City took the e-commerce as a government "number one" project, and as an important pillar industry to focus on training, and to take planning leadership, policy support, the operation of the market to promote the rapid development of the city's e-commerce. We hoped that all the enterprises to strengthen policy docking, seize the opportunity to actively plan and promote the transformation and upgrading of enterprises, and make a positive contribution for the city's rapid development of e-commerce! At the meeting, Executive Vice General Manager of China Transport Group Li Zhenbo represented the Group to share the successful experience of enterprise transformation. In recent years, China Transport Group actively respond to national policies to bold pioneering and innovative, and successful transition from the traditional sales model to the modernization of e-commerce marketing model, and became the province and the country's industry model through the e-commerce information industry to promote traditional enterprises successful transformation, and to be the leader of provincial enterprise information construction, repeatedly spoke highly by the state, the provincial and municipal leaders. At the same time of positive development of enterprise e-commerce, China Transport Group also attached great importance to the construction of the e-commerce platform, independently developed and operated six e-commerce services platforms of 1kuang.net, zgwlwlw.com, zgnongke.com, cccjyw.com, 1youw.com, haitaomingpin.com, and made an outstanding contribution to promote the transformation and upgrading of the national machinery manufacturing industry! The Group's outstanding achievement in the e-commerce, cross-border e-commerce, e-commerce platform construction, e-commerce elite training and some other areas was highly praised by the leaders and enterprises. Vice Mayor Zhang Shengming pointed out, as the benchmarking enterprise of e-commerce developing in Ministry of Commerce, Shandong Province and Jining City, China Transport Group greatly promoted the development of Jining e-commerce industry, and made outstanding contribution to Jining e-commerce transformation and development, all the counties and towns and districts must seriously study the advanced experience of China Transport in the industrial e-commerce transformation and development. Emancipate the mind, seize the opportunity to accelerate the transforming and upgrading pace of our industrial enterprises. At the same time, Mayor Zhang further clarified the government would make more efforts to support the key e-commerce enterprises and guide more enterprises to embark on the road of e-commerce development! Manager Li said that thanks to the leaders of Municipal Party Committee and Government for the strong support on the development of China Transport Group over the years, in order to better play a leading role, lead more enterprises and elites to embark on the road of e-commerce development, China Transport Group invested and founded Jining industry and information vocational training school, which based on the strong group strength and rich experiences in e-commerce elites training of China Transport Group, provide a standardized, high-quality service and training platform for the city and the southwest region of Shandong province, benefit more enterprises, cultivate more e-commerce elites for the society, make more positive contributions for the e-commerce development of Jining!